Accessory to keep regular shaped pedals fixed to the Smart Track. The Fastener is the accessory that..
Soft Case for 6-8 pedal guitar effect 45Χ33cm. .. If you are one of those guitarists who only carry the essential and you want to take your 3 or 4 fav.. If you’re one of those guitarists who only brings the essentials and you want to keep your thr.. Compact, solid and very easy to carry, the Velcro®-based pedalboard Evo Track XS2 is t.. 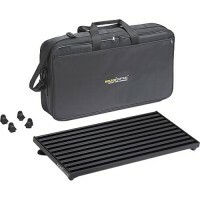 The Smart Track XS2 pedal board is compact, solid and durable, making it the ideal option .. Looking for a pedalboard that can hold from 8 to 10 effects pedals? We’ve got the perfect..
Hardcase Pedalbord for 6-8 pedal effect 45X33cm guitar effect. The PT-JR-HC is designed fo.. The largest of the Evo Track pedalboard family, specially designed for musicians who need .. If you use a lot of guitar effects pedals when you play and need to add or change their or..
Hardcase Pedalbord for 8-10 pedal effect 63X33X5cm guitar effect. The PT-2-HC is designed for p.. The largest model of the Smart Track pedalboard family is designed for professional musici..
Hardcase Pedalbord for 12-14 pedal effect 81X40X89cm guitar effect. The PT-2-HC is designe..